Part of my "Technology First" series. No doubt, the title to this entry is a colorful one. While it may sound unappealing, the idea behind it is critical to running a high quality classroom with a strong tech focus. “Dogfooding,” simply put, is subjecting yourself to the same food, tools, or products to which you subject others. While the phrase comes from the world of software development, it is no less impactful in a classroom environment. If you expect students (or your teachers if you are in admin) to use a product, you must use it yourself and become at least as much of an expert as they are to become. In my classroom environment, we have moved to daily technology use. Nearly everything we do involves a Chromebook and the use of Google Apps for Education (GAFE). In my day to day use, this means that I too have made this switch. I have a high powered WIndows desktop with a large monitor and MS Office. However, I rarely use this setup. On most days I use the same Dell Chromebook that my students use, and do almost all of my “office” work using GAFE. I know the student devices and software at least as well as my students know them. As problems arise, I can solve them. Since I have a portable device, I often sit at a table with my students while doing work, or can move around the room connecting both in human and technological ways as needed. I rarely sit behind my desk, greatly reducing problems, allowing classroom management by proximity. Whenever possible, use the same hardware as your students. As often as you can, use the exact same software as your students. For Admin: if you have a product for one class of users and a product that serves the same purpose for a different class, seriously consider migrating everyone to the same product to increase efficiency. I do not want to give anyone the idea that you must use Google Apps and Chromebooks. This same methodology and benefits work on iPads, Surface, or whatever else you have chosen. The idea and important concept is that daily and consistent use of the same tool for administrators, teachers, and students will make everyone an expert in time. Email: In many schools, office staff and teachers use Outlook while students use Gmail. Even worse, many teachers have to use both. It is not advantageous in any way to have to switch between two systems that do the same thing. This is an ideal scenario to eliminate costs for hardware, training, and making a school environment run more efficiently. There may be some who would object to this move on various grounds, but many organizations have made transitions like this and had great success. Office Productivity: Pick one office product and move everyone to that product. I utilize GAFE and Microsoft Office. MS Office is more powerful, but GAFE is more convenient and easier to use, and also free. If your organization uses both, seriously think about standardizing. If you are going to stick with MS Office, you should think about migrating to Office 365 and move everyone online. If you have been in the classroom for a while, you are well familiar with Bloom’s taxonomy. If you are knee-deep in Common Core, you know all about Webb’s Depth of Knowledge (DOK) which, simplistically described, is an update to Bloom’s. In the technology sphere, there is a similar model that has a practical connection to the Bloom’s and DOK, but has been built around levels of technology integration in the classroom. 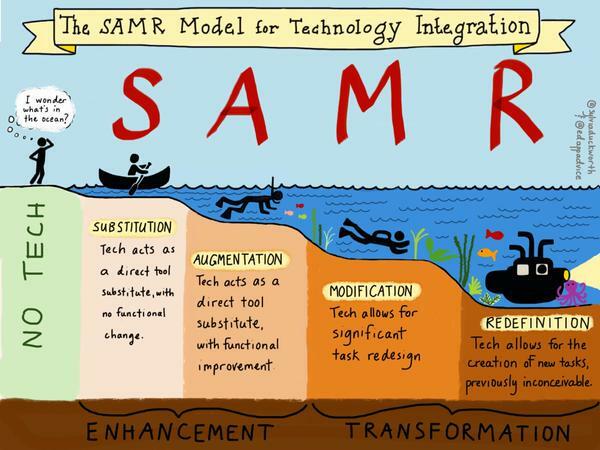 This is called the SAMR Model and it has become very influential in the educational technology universe. There is a second model that has also become widespread, it is called TPACK which is really more about the teachers preparation and the interaction of their skills than it is about the particular lesson. These two models will be the focus of this post. If you spend any time in Edtech circles, or go to any training on technology integration, you will encounter these two acronyms sooner or later. Check out the Twiterversity guide for more. I am presenting on Google Sheets tomorrow at Stanislaus ETC! 2017 at CSU, Stanislaus. Everything you wanted to know about spreadsheets but were terrified to ask!!! Putting my freshly minted Google Certified Trainer status to the test. Check out my sessions and stop by if you are at the conference. Copyright 2014-2016, by Jeff Welch, all rights reserved..